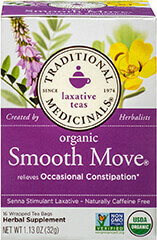 Gentle Effective Relief Herbal Stimulant Laxative Digestive System Tea Promotes Detoxification Triple Leaf Tea comes from such a tradition. It is made in the U.S.A. by a Chinese American family-owned business. The company owner can remember stories of his own grandfather selling herbs and teas in his village in China. Today, these traditional Chinese herbs and teas are available to you. We wish you harmony, balance, and well-being. 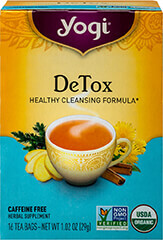 Dieter’s Tea Cleanse & Trim from Only Natural has a country herbal flavor, a new and improved formula, and is caffeine free. The herbs combined in this tea include Senna, Uva Ursi, and Alfalfa, which are carefully selected for your benefit. Feel wondeful after drinking this delicious tea! Collagen is a major structural protein in the human body (found in skin, joints, bones, blood vessels and connective tissues.) As we age, collagen naturally breaks down and diminishes over time - leading to the early signs of aging. 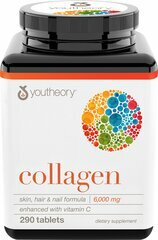 Youtheory® Collagen Advanced Formula with added Vitamin C is designed to help replenish the body's supply of vital protein. ** This product delivers intensive nourishment to help counteract the effects of the aging process. Collagen Advanced Formula Type 1, 2 & 3 is manufactured by Youtheory™.